UPDATE: Hannity defends his onstage appearance at the Trump rally. Fox News hosts Sean Hannity and Jeanine Pirro were guests at President Trump's rally in Missouri Monday night for Republican Senate candidate Josh Hawley. When Hannity took the stage, he delighted the crowd by calling the reporters in the back of the room "fake news." It was especially surprising because earlier in the day Hannity said he would not be campaigning with the president, CNN noted. Trump called Pirro to join him onstage too, and she in turn encouraged the room full of Trump supporters to channel their energy into voting. "If you like the America" that Trump is making, she said, "you’ve got to make sure you get out there tomorrow if you haven’t voted yet." Their appearances caused CNN to question Fox's credibility. "They’re having a schizophrenic moment over there trying to figure out what their role over there is supposed to be with the Trump presidency,” she added. Camerota went on to pose a hypothetical, suggesting that if her fellow anchor Don Lemon had joined one of the Democrats at a campaign rally, he would not have emerged unscathed. 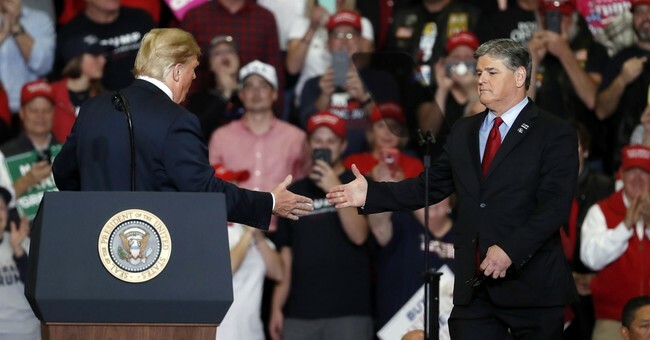 Following the campaign event, Hannity said he had "no idea" the president was going to call him onstage.